Originally opened as a Dutchland Farms restaurant in roughly 1934, the Laconia store enjoyed a very colorful history. It was initially located in Laconia, at the intersection of Route 3 (Daniel Webster Highway) and Route 11. As the largest city in the Lakes Region, Laconia had become a popular destination for motorists by the 1930s. The natural beauty of nearby Paugus Bay and Lake Winnipesaukee had long been Laconia’s greatest attraction, drawing in tourists far and wide to the city. The Route 3 and Route 11 intersection, locally known as McIntyre Circle, was another gateway, tying the Lakes Region to the seacoast, the White Mountains, and points south. Thousands of motorists would pass through this interchange each year, on their way to the lakes for the summer and the north country for skiing in the winter. It is no wonder then that Dutchland Farms picked this specific location to erect one of its roadside restaurants nor any surprise that HJ later sought to incorporate this franchise into its emerging empire. The first known listing for HJ at this location was 1938. For approximately ten years, McIntyre Circle was a very viable location for HJ. Meanwhile, about three miles north on Route 3, Weirs Beach was fast becoming a hot spot for summer tourists and vacationers. Traffic flow was increasing dramatically through this area, drawing in restaurants, gas stations, and shops. 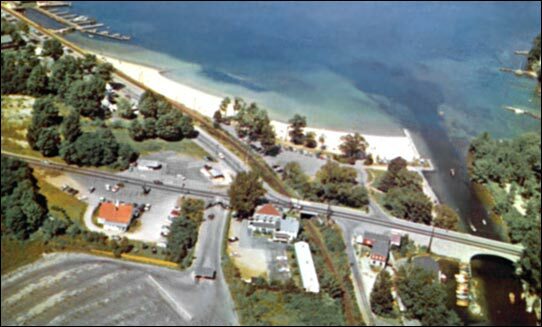 By the late 1940s, traffic flow at Weirs Beach was far supplanting traffic flow at McIntyre Circle. As a result, HJ moved the Laconia store to Weirs Beach in the late 1940s, constructing a new neocolonial style building to house the relocated restaurant. The new structure was similar in shape and form to Hooksett, a single dining room structure, with a Portsmouth style cupola, three large dormers with rectangular windows, and a square-closed entrance way. It is believed that at least the cylinder and cone portion of the cupola were moved from the Laconia location. The Orleans type sign that was erected at the new site surely was moved from the old location. The Weirs Beach store was situated on Route 3, directly across from Lakeside Avenue, the main entrance to Weirs Beach. A large flashing neon sign reading “Weirs Beach” was positioned at this intersection, capturing the attention of motorists traveling along Route 3. Likewise, the entrance to the Weirs Beach Drive-In movie theater ran alongside the HJ property, drawing in motorists. Thus, in locating its store adjacent to this intersection, neon sign, and movie theater, HJ had claimed the best possible real estate in the area, assuring that everyone passing through would see its restaurant. For this very reason, HJ dominated the landscape here for many years. In the mid-1960s, the Weirs Beach store received a makeover. Different from Hooksett, this location was shorn of its neocolonial cupola and dormers as well as its sign. In place, a new Nims Two style cupola was added along with a trapezoid type sign, topped with Simple Simon and the Pieman. At one point, in the late 1960s or early 1970s, the roof was painted gray for a time but was subsequently returned to original orange. Another makeover came in 1975, when the restaurant was expanded considerably on the right-hand side. The railroad station from the defunct Steam Village in nearby Gilford was moved to Weirs Beach to become a part of the HJ complex. Steam Village was a narrow gauge tourist railroad that operated for a couple of seasons in the mid-1960s, located about a mile east of McIntyre Circle on Route 11. Its railroad station (originally from a rail line in Massachusetts) had stood vacant in Gilford since tourist operations had ceased. As a welcomed addition to HJ, the station housed the new Gandy Dancer Saloon, a bar and tavern featuring a railroading theme. In the early 1980s, the Weirs Beach store was sold by its original owners, who had owned the franchise since its opening in 1934. Shortly thereafter, the new owner dropped the HJ franchise and renamed the complex the Weirs Beach Family Restaurant and Gandy Dancer Saloon. The top part of the cupola was removed, as was standard practice for Nims Two style cupolas when restaurants were re-branded, and the trapezoid sign was encased in a new wooden sign for the new restaurant. A sign featuring the words “HAV-A-BITE” was also added above the front entrance. Much like Hooksett, this location’s reincarnation was only short-lived. The entire complex burned to the ground on October 7th, 1984, and although the new owner had planned to rebuild, this never occurred. Today, the location remains a vacant lot, used on occasion for bus parking and outdoor vendor space. The covered-over trapezoid sign is the only HJ relic that has survived the course of time, now serving as a signpost for the nearby Weirs Beach Lobster Pound.